These Horsebit earrings from Gucci are the perfect attention-grabbing piece. 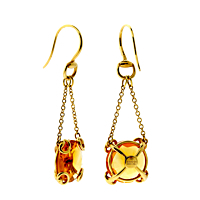 Featuring large faceted Citrine stones engulfed in the horsebit motif. In addition, the horsebit design elements are a subtle reminder of Gucci's fearlessness when it comes to creating distinctive jewelry.